Gold Production played a major role in the settling of Arizona and was the driving force behind the economic development of Wickenburg. The Famous Vulture Mine was the largest producing gold mine in Arizona. While the trains are silent today, Gold and the Wild West are inextricably intertwined. These glycerin-filled vials contain a small amount of gold flakes. 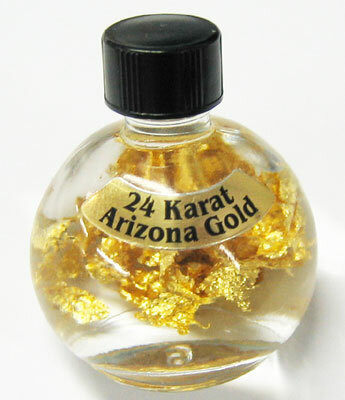 The gold in the vials is produced from mines still active in Arizona. A descriptive card detailing the history of this precious metal and its role in the American West is included with these vials.